After countless desperate pitches, scores of alpine summits, and miles upon miles of backcountry powder, our R1® fabric has compiled a worthy résumé. It stretches, breathes, wicks and warms with ultimate efficiency, and the full-zip iteration offers added versatility. The finely tuned high/low interior grid polyester (Polartec® Power Grid™), exclusive to Patagonia, is now even lighter and more breathable. With its technical fit and durable fabric, it squashes down to practically nothing in your pack. The snug-fitting hood stays comfortable under a helmet, and the front zipper finishes with a soft kissing-welt garage at the chin for next-to-skin comfort. Pocketing: one zippered left-chest and two drop-in low-profile handwarmers. The stretchy cuffs push up comfortably over your forearms. Polygiene® permanent odor control ensures civilized tent time. 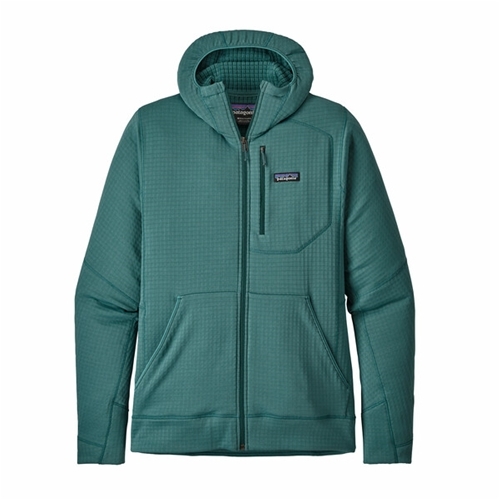 This Patagonia Men's R1 Full-Zip Jacket is really great. Now only does it look amazing, but it's also very warm and built really great.